Lugganammer is the 1407th highest place in Ireland. Simple summit, Driveable to top. 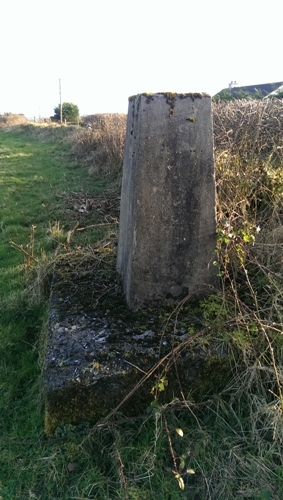 The trig point is in a field, about a metre or so inside the hedge/fence with the public road. Simple access from R201 Carrigallen to Mohill road. About 7km from Carrigallen, at a sign to the right for Aughavas, turn right here. Pass Aughavas church, then primary scholl on the right hand side, then after a thatched cottage on the right, a junction with a minor road going right, follow this minor road broadly South (narrow road, grass on centre, lots of bends so take your time). Go straight thru at a crossroad where you are asked to yield. When you reach concrete water reservoir (has wind vane and solar panels on top), pull over to the left as you can park your car here off the road, you are about 4km from R201. The trig pillar is just beyond the reservoir in the field and almost touchable across the fence from the road (no need to cross into private field) at N1879798186 A. If you look behind at this point i.e. North, you can see the breadth of the Breifne range, Iron Mountains, Cuilcagh, and Slieve Rushen, and these are even more visible as you return by road the way you came.